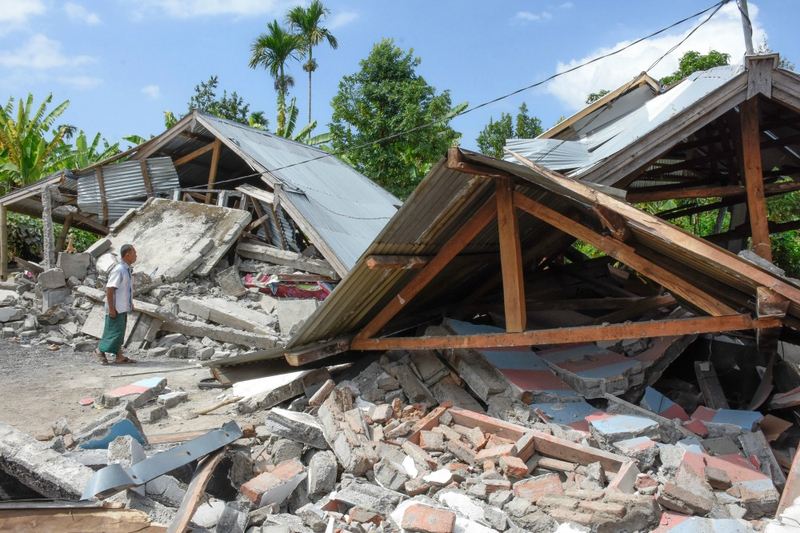 Parts of popular Indonesian island Lombok have been left devastated after a shocking 7.0-magnitude earthquake struck the island early Sunday evening, killing at least 91 people – as of Monday. At 7.46pm local time on Sunday night, the northern area of Lombok was hit with an earthquake that was strong enough to be felt as far as the neighbouring island of Bali. The shocks triggered a tsunami warning that was eventually dismissed after waves were recorded at a height of just 15cm in three villages. A spokesperson for the country’s National Disaster Mitigation Agency (BNPB) confirmed the death toll was 91 on Monday, and said all the victims were Indonesian, according to several reports. While the airports in Bali and Lombok continued to operate throughout the earthquakes, electricity was briefly cut in Lombok causing a half hour evacuation. The Bali airport suffered minor structural damage. Thousands of locals abandoned their destroyed houses to find safety in wide open spaces. Thousands of homes have been reduced to rubble following the earthquake. Source: Getty. Australia’s Minister for Foreign Affairs, Julie Bishop, was in Indonesia at the time of the natural disaster. Bishop said the Australian Government has already provided urgent supplies such as food and water to the Indonesian Red Cross. “I extend our deepest sympathies to the people of Indonesia and particularly those who have been directly affected by this natural disaster. The Australian Government stands with the Indonesian Government in offering our support should that be required,” she said. The minister said she was on a flight travelling to Bali when the earthquake occurred however she managed to make a secure landing and was immediately marked as safe by authorities. While the government is still assessing numbers, at this point there have been no Australian casualties or serious injuries as a result of the earthquake. Minister for Home Affairs Peter Dutton and his delegation were also in Lombok at the time and were evacuated from their hotel before being flown to safety in Bali. The island is still suffering aftershocks that have been as strong as 5.4 magnitude. Dr John Ristau, a seismologist at GNS Science, said that earthquakes of this magnitude are not unusual for this particular region due to their unfortunate geographical location. Any Australians that require assistance in Lombok have been urged to contact the Department of Foreign Affairs or consular staff located in Lombok or Bali. Bishop expressed her hope that life could return to normal for Lombok locals after they managed the overall damage.